Reminder: My "Friend Zone" talk at Northwestern is tonight! The details: It’s at 7 PM in Kresge Hall 4365, which is on the Southern end of campus, near “the rock.” (Here’s a map.) If you’re taking the el, get off at the Foster stop and head east; then a little ways south when you hit campus. Good luck, David! I’m sure you’ll be awesome. Good luck! I’m wishing you the best from my bunker beneath the sea! Awesome, I wish I could be there to hear your thoughts on this subject in speech format! I wanna go too! Why can’t I have a wormhole that immediately transports me to wherever/whenever I want to go? Good luck with your speech, David! Maybe you could post some highlights, for folks who aren’t in the Chicago area and don’t have access to a functioning wormhole? Good luck, David. Will you be recording the talk? Beware of red-haired women protesters! I hear they’re scary or mean or something. May the Great Old Ones and the Elder Gods be with you! Make all men become slaves to their furry overlords! Thanks, everyone! I’m back from the talk. It went well, decent crowd (50 or so, room was full), good discussion. No protesters. It wasn’t taped, but I may end up doing a video version if I can figure out how to turn my powerpoint powerpoint presentation — I used a lot of internet memes to illustrate my points — into a youtube video (which I gather is possible; I know there are some tutorials on youtube). I’m three hours south in the Peoria area, just far enough to *not* be able to make the drive in time to catch your talk. I do wish I could be there, though! I read your blog frequently without comment, but I absolutely adore what you do! I suppose I should say so more often! So more people at your talk than at the AVfM “rally” in Toronto? Awesome. Glad to hear it went well. Looking forward to seeing an eventual YouTube of it. I’m glad you’re lecture went well. I feel bad that it wasn’t taped. I’d have really liked to hear it. Maybe you could at least post a transcript? Hoping for a summary post, at least. Good to hear of good attendance and good discussion and no pulled fire alarms. A post outlining most main points would be worthwhile. Sometimes I’m so shocked and yes, intimidated by the violent speech and attitudes of men you write of, so don’t comment but it is good to see your commitment and real anger. You write as you must be speaking because it’s smooth to read and some of the antagonists really sound like creepos. Breaking news: First feminists murdered Erin Pizzey’s dog (only Pizzey admits that she has no idea who shot her dog, and the dog didn’t die), and now they’ve taken over Canadian utilities in order to harass feMRA typhonblue! Will feminazis stop at nothing? @cloudiah: Well, we’re all communists up here, didn’t you know that? Feminist Communists…so of COURSE we control the power companies. Glad the talk went well, David. I would also join in the requests for a transcript. If you run into difficulties turning it into a video, give me a shout. I’ve got an alternative set-up I’ve used for generating videos with timed images and so forth that’ll work if the direct conversion proves troublesome. Not that this altruism is in any way motivated by wanting to see the presentation myself. No sir. I’m glad your talk/discussion went well, DF. 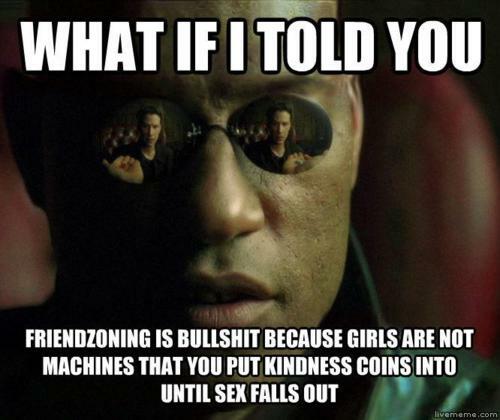 Just showed the Morpheus meme to my son (who turns seventeen tomorrow). He thought it was quite amusing.